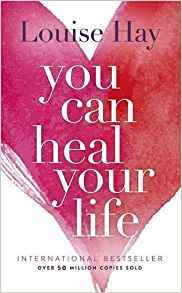 Louise Hay introduced many people to the mental patterns behind particular diseases as well as the healthy patterns that the body needs to heal. 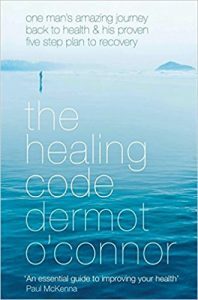 It is an excellent introduction to the concept of the underlying psychology behind illness as well as the idea that you can heal your body by healing your life (rather than waiting for someone outside of ourselves to find us a cure while we continue to live in the same way). 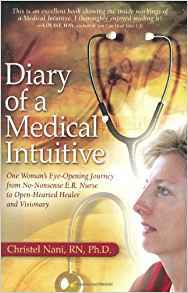 This book is the diary of Christel Nani, a nurse and gifted medical intuitive. Though the book focuses on the underlying cause of diseases in general, she had multiple sclerosis. 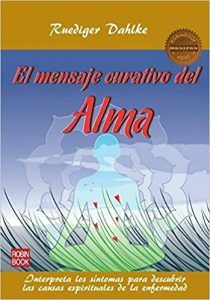 In the book, she talks about how people with the same disease have the same energetic patterns and lowered vibrations. Peoples’ negative emotions, thoughts, unhealthy patterns of behavior lower their vibrations (tribal beliefs, toxic thoughts, other people’s energy) and allow illness to resonate in their bodies. Simply treating the symptoms will not raise a person’s vibration, it would merely buy time. Focusing on raising one’s vibration would not only lead to physical, emotional, and spiritual health but could prevent illness. Feel you don’t deserve to be loved. Feel unworthy. Think of others before you think of yourself. Silence your own needs; yet take care of others insistently. High self-esteem, love, trust, generosity, and happiness. She also pointed out that if we get some benefit – emotional, psychological, or practical – from having their disease, we won’t get well no matter what treatment we are given. This obstacle needs addressing on our journey to healing multiple sclerosis to be successful. 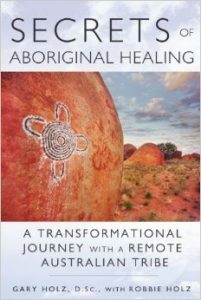 This book on multiple sclerosis details Gary Holz’s remarkable journey of healing from his MS through the work he did with a remote Aboriginal tribe. The main concept of the tribe is that the day we are born, we are a body-mind-soul. What we do to one has a direct effect on the others because they are the same thing. If our external and internal universe is working in harmony, we will be healthy spiritually and physically. If not, we won’t. The book goes through each one in detail and what he, through his MS personality, had to let go of and to learn. Of course, one of his first struggles, very much a personality trait of MS, was his impatience and wanting to get it done now so that he could return to his life! He went through quite a journey of learning, letting go, and change. And it significantly improved his symptoms, and he recovered feeling in his body. The book is chalk full of examples of working through the beliefs, behaviors, and emotions related to those diagnosed with multiple sclerosis. 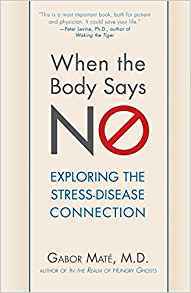 In Deb Shapiro’s view, the mind is reflected in every part of the human body, and through the body, we can get in touch with the issues that we have been repressing, denying or ignoring in mind. The role of the mind and emotions in our state of health is vital. If something goes wrong in the body, it is a combination of physical and psycho-emotional. Bodies are not things that only need mechanical repair. 4. Self Critical and Judgmental of ourselves including blame, guilt, and shame. Trying to do too much on our own. Not getting or asking for support. Automatic and compulsive regard for the emotional needs of others while ignoring our own. Automatic and rigid identification with duty, role, and responsibility rather than the needs of the self. Suppression of what we call negative emotions. Feeling responsible for what others people’s emotions and we think we must never disappoint anyone. Not being able to withdraw from their helping mode, the desperate need for approval, and major boundary problems especially with a parent or sibling (to the point of not experiencing where one ended, and the other began). Many of those that eventually express MS in the body are exposed to chronic stress in childhood while, due to circumstances (such as a narcissistic or alcoholic parent) could not respond in either fight or flight (our natural instinct) and felt helpless in these situations. The stress eventually becomes repressed and invisible to the point that we no longer realize we have needs ourselves and we consider it normal to constantly have to meet the needs of others. He documents this chapter with plenty of research behind stress and psychosocial factors and the onset and progression of MS. This book on multiple sclerosis documents Sharalee’s journey from imbalance, numbness, extreme fatigue and sometimes bedridden to becoming completely symptom-free. Her story is told by her as well as her NLP practitioners (you can read about our interview here). Sharalee and I will soon be doing a series on using NLP for MS. Subscribe to our newsletter to receive this course directly into your inbox. Being very dissociated with feelings, our own needs, and body and externally orientated to becoming more associated into life, our emotions, our body and the hear and now. Learning to trust the body and talk to it as our best friend. And learning and trusting that you have all the resources, you need to become a healthy human being. Removing the limiting beliefs around not ok to feel, this will only get worse, I am here to make you happy, etc. 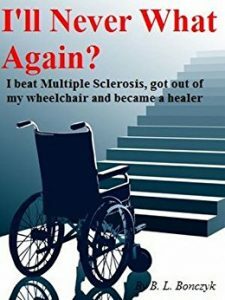 B.L Bonczk book on multiple sclerosis tells his journey from the time before he was diagnosed with Multiple Sclerosis, through his doctor telling him he’d never walk nor work again to his full recovery. It’s the story what he learned on the way, the pushes he received from the universe, and his eventual journey into becoming an alternative healer and hypnotherapist. In his book, he emphasizes the importance for us to realize that our bodies want to achieve health and can work to heal itself. It’s our work to free ourselves from the thoughts that we are not good enough and that we can’t do something. And firstly, we need to stop believing what anyone else says we are or can be–and trust our instincts to become everything we are capable of. Unfortunately, this book has not been translated into English. His book “The Healing Power of Illness” can help us understand the relationship between the mind, the soul, and disease. I interviewed and then studied with Dr. Dahlke for a year (you can read about my interview here). Ruediger Dahlke’s approach is to look at symptoms and illness not as our enemies, karma or punishments, but as our teachers. The purpose of our symptoms is to give us information about underlying issues in our lives that are out of balance, such as emotions we have been suppressing and challenges we have not been facing. If we do not notice and address these issues while they are still on the energetic level of emotions, mind, and spirit, they eventually present in the body, so we have to notice. His work gives us the tools to understand the underlying energetic components of symptoms and the types of actions we can take to restore balance. When we do this, the symptoms are no longer needed, and we can heal. 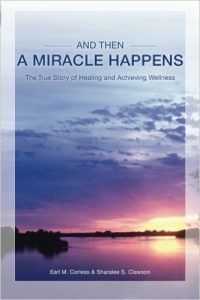 According to Dr. Dahlke’s book, the mission of multiple sclerosis is to abandon the fight. The program I offer works through these underlying beliefs, behaviors, and emotions described in these books on multiple sclerosis. Our goal is for you to create lasting health If you are not yet ready to work through your MS but want to work on a few emotional or traumatic issues, we can do that as well. I get excited when my clients say “it’s probably not very likely we can change this about my personality or relationship style…or do you have some technique for it?” Those words are honey to my ears! If you would like to have a free consultation to see if the program is a good fit for you, call me at (+1) 415.699.2574 (I have FaceTime and WhatsUp for those outside the US) or contact me. Be sure to revisit this page often. As I find more books on multiple sclerosis, I will be sure to post them here!